Christmas Tree O’Digital Logic from PyroElectro « Adafruit Industries – Makers, hackers, artists, designers and engineers! The Holidays are once again upon us and we wanted to give our readers the edge in decorating this year. Continuing our all-digital-hardware theme to coincide with our Kickstarter for a Digital Electronics Course at PyroEDU, we have created an LED Christmas tree controlled entirely by digital logic! 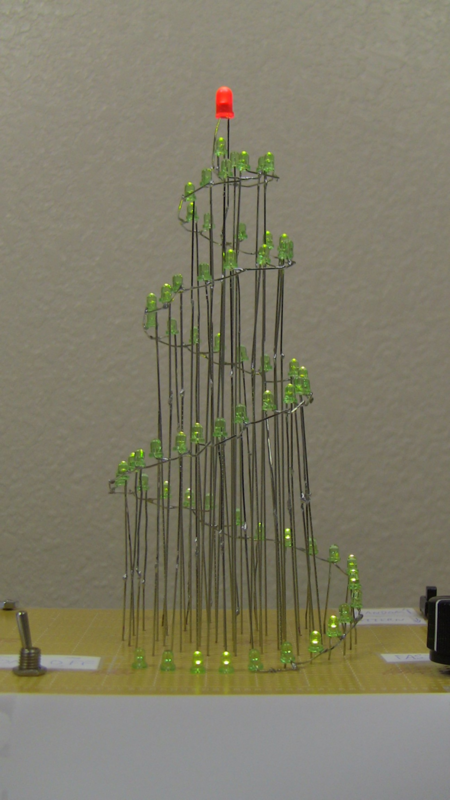 In this article, we will show you the process we took for building the LED Christmas tree. The LED control will be done entirely in digital logic and hardware, no software! There will be multiple display modes you can set, as well as a bit of ‘speed’ control, giving you full control over how you spread your Holiday cheer. Now get out your soldering iron and get ready to make some artwork! 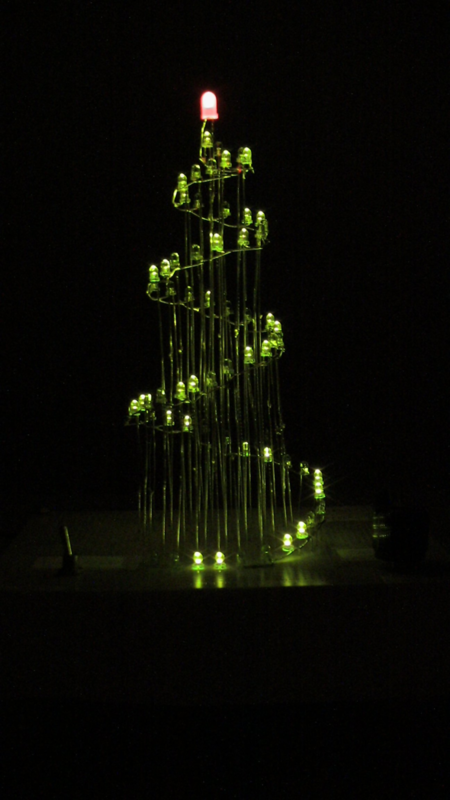 The goal of this project is to make a Christmas tree using 64 LEDs. The tree will be a cone shape with LEDs spiraling around it until they reach the bottom. Each LED must be individually controllable by the hardware interface. The final display should feature two modes: a predictable pattern for LED on/off generation and a random pattern. To build the tree, we’ll use 63 green LEDs and 1 red LED. Lots of wire will be needed to make the spiral + cone shape of LEDs from top to bottom. To build a random pulse generator, we’ll use some digital logic trickery with a 7404 hex inverter. A 555 timer will be used to drive 8 shift registers, which will control all 64 of the LEDs. Finally, a 4 bit timer should be thrown into the circuit in case we want to slow things down with a divider.